-a surprising and welcome event that is not explicable by natural or scientific laws and is therefore considered to be the work of a divine agency. -a highly improbable or extraordinary event. development, or accomplishment that brings very welcome consequences. 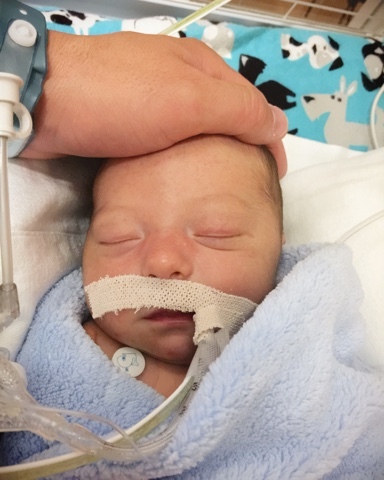 Just 3 days after the birth of our perfectly healthy baby boy, Dash, we were completely blind-sided and faced with losing him in a matter of hours. Our faith was tested like never before. Prayers were said like never before. 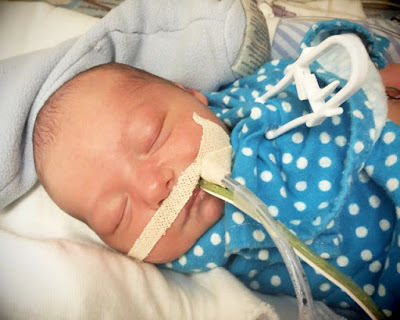 The survival of our son was dependent on a miracle, and that's exactly what we received. Today he is 12 days old and counting. Perfectly healthy baby boy, passed all his tests, nursing well, scrumptious. 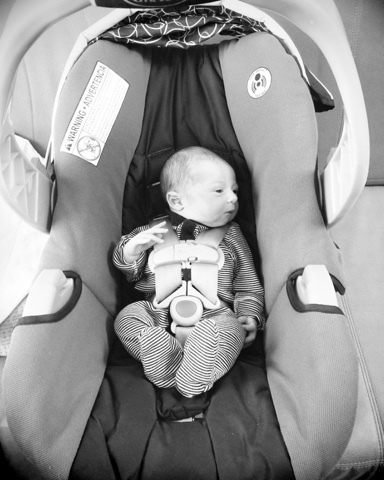 Dash and I were discharged from the hospital to go home. 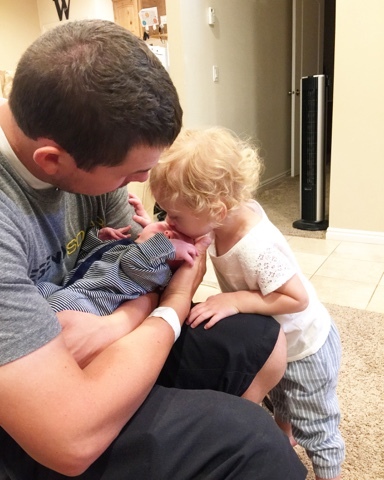 Dash began having slightly yellow spit-up. Colostrum possibly? Yeah, probably...my milk wasn't in yet. He continued to have small amounts of yellow spit up throughout the day. I did a little Google search that mentioned it could have something to do with getting too much to eat. He did have two 40 min feedings so I started to cut him back to 10-20 min. A tiny amount of lime green spit up. I turned to Bodie and said, "That's not good." I didn't know why exactly, I just remember seeing something about "green" when I was reading up on the yellow. I told him to grab the folder of hospital papers and brochures that they send home with you after birth that you never really look through. Skimming...skimming...BOOM. There it was: SEEK EMERGENCY CARE FOR THE FOLLOWING: Green spit up or vomit (among other things). I called the hospital, spoke to a labor/delivery nurse, she said to come right into the ER and to bring the clothes/blanket with the vomit on it. We were out the door in 10 min. In the triage they took Dash's measurements and while on the scale he vomited a large amount of green. They told us it was bile. We met with the doctor, explained the vomit. He called a local pediatrician (*Note: Not a pediatrician at a hospital, but a pediatrician at a local office. The local office we told him we were going to go to for Dash's care in the future.) That pediatrician told him to do an X-ray to see if the stomach was distended (big) and to check for any obstructions/blockages. X-ray came back fine. Didn't seem interested in the blanket with vomit on it. Doctor consulted with the pediatrician again via telephone and was told to send us home, but to call his office first thing in the morning at 8:30 am to schedule and appt. to come in and see him. We went home as ordered...watching fireworks along the way. During the night he vomited again at 2 am and 6:30 am. We arrived at the peds office. The male ped that the doctor spoke with the night before wasn't there (he said he would be) so we met with a female ped instead. Real nice lady. Told her about the green, talked about the blood in diaper- showed her the diaper. His temp was fine, his weight was down 12% vs the recommended 10%, prob because he wasn't nursing that well previous night and part of the previous day. She wanted to find out if the orange/red color in the diaper was actually blood or some crystal things that would mean he was dehydrated. I stepped out with Dollie while she put in a catheter to draw out pee. Tested the pee- not blood, just crystals from possible dehydration. He vomited again during the catheter process. At that point I told her we had discussed the weight, discussed the pee, but had yet to talk about the green vomit. I told her that based on what I read in the hospital papers and online that green= NOT GOOD so we needed to get an answer. We needed more info. We needed SOMETHING. She really didn't have much to say about it. She didn't know. So she called that same ped back that the doctor called the night before to consult. 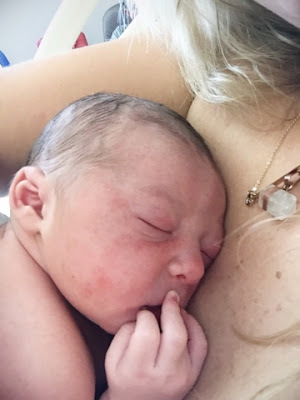 She came back in offering 3 options that he provided: 1) go back home and wait it out, see how he does and if he improves, 2) Go back to American Fork where he can meet us and see Dash himself, or 3) go ahead and go to Primary Children's or Utah Valley Regional Medical Center "if we wanted to." We sat there for a couple minutes, I asked Bodie what he thought. He said we probably ought to just go. I turned to her and asked what she would do and she said she would probably just go to one of the hospitals. We agreed, and then had to decide between UVRMC or PCH. Ends up they both have pediatric specialists so we chose UVRMC based off of convenience with Dollie and being closer to home. Since we had already went the ER route the night before she said she would call it in for us so we wouldn't have to go through the ER again and could just go to the pediatrics floor. She just had to get approval I guess. She came back in and told us there was a change of plans. She spoke with a Dr. Beverly who told her to give him the 10 second version of what was going on because he was in the middle of sedating a child. She told him something simple like, "green bile vomit" and he said, "Tell them to get to the ER IMMEDIATELY. 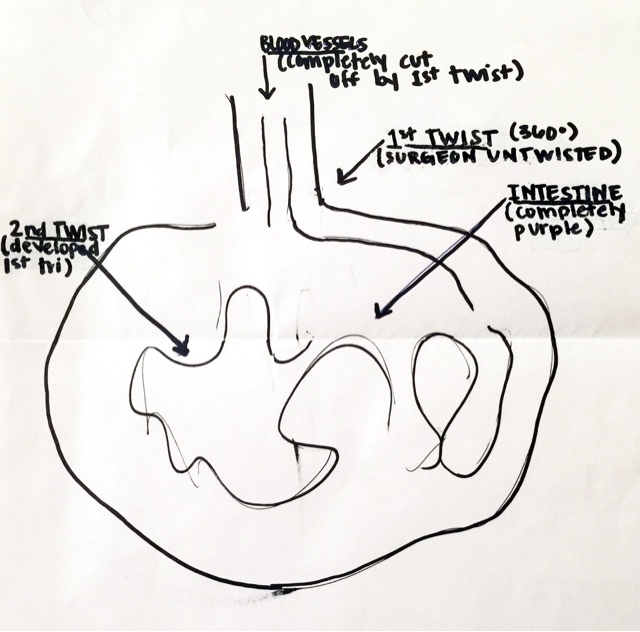 We need to do an upper GI tube to see what's going on in there." Okay...out the door we went. But not before Dash vomited again. Along the way we called all of our parents and Bodie's mom got in her car to come help with Dollie. We arrived at the hospital only to find Dash had vomited again. We went in and waited...and waited...and he vomited AGAIN. It was getting worse. wanted to see that doctor who told us to come right in. We wanted to get that test done immediately. What seemed like forever later (3 hours to be exact from arrival), and a couple more vomits, Dr. Beverly (the one who ordered us to come in), a pediatric specialist, walked in and introduced himself. He said, "When babies and kids come to see me they don't come for mild things. I only see very, very sick kids. There are 5 things that worry me the very most when a kid comes in...meningitis, something, something, malrotation, something... And your baby has two of those things that worry me the very most. When I see green bile vomit my biggest fear is called malrotation with mid-gut volvulus. I am nervous about your baby- that's what I get paid to do. I get paid to be nervous, get results and find out what is wrong. I'd like to kind of push you out of the way and get this test done so we can rule out malrotation with mid-gut volvulus and then we will go upstairs and work on ruling out 20 other things it could be." Perfect. That's what we wanted to hear! A freaking doctor who is gonna get in the game and get some answers! He explained that the test was basically a 3-D x-ray where they give Dash a contrast drink and watch it travel down through the intestines to check for any obstructions (blockages, twists, etc). As long as he took the drink they wouldn't have to put a tube down and do it that way. Bodie's mom stayed behind with Dollie and we headed for the x-ray test. We had to stand behind some windows while they laid Dash on a table and gave him a bottle with the liquid. Thankfully, he took it down well so they didn't need the tube. Soon after, though, he started vomiting and lot of it came up. He was screaming and they had him on his side with a suction tube in his mouth. It also was coming out his nose. They kept holding him down. It was awful. That's when the tears started flowing from both of us. I had never seen tears like that from Bodie. Little did I know it was nothing compared to what was to come. Dash eventually settled down and we waited. Watching the screen as this black liquid slooooowly traveled. After about 10 minutes they came in and explained to us what we were seeing on the screen. Then they said, "So we would have seen it travel through this area but it hasn't. It should have by now so that means that it has stopped and there is an obstruction. Dr. Beverly said he was to be immediately wheeled into surgery AKA He had a malrotation with volvulus. The exact single thing that the doctor feared most. Great. He tried to make it seem not scary by telling us they would make a tiny incision and check for any twists in the intestine and then tuck it back in. No big deal. We went back to the triage room where Bodies mom and Dollie were and waited for them to come get Dash for surgery. They took us back to holding and we waited for about 10 minutes. We spoke with the anesthesiologist, as well as met the surgeon. They re-explained what they would be doing and said it would take about 30 minutes and that we could wait in the waiting room. Surgery began and we waited. At this point Dollie hadn't had a nap. We had been gone all day so we had Bodies mom take her to our hosue and told her we would keep her posted. It was just the two of us in the waiting room. While in the waiting room of course we were nervous. But we were very optimistic and assumed they would fix whatever the obstruction was and then we would be on our way. We heard the surgeon in the hallway talking to someone. We couldn't see them but we heard them say things like "untwisted it", "intestine" so we knew it was about Dash. We stood up and the surgeon and this lady started walking toward us. He explained that part of the intestine at the very top was completely twisted 360 degrees, and was preventing any blood from flowing to the intestine. He untwisted it all the way. Phew! Thanks! Awesome. Problem solved...right? Wrong. He then said, "But there is still an issue. When I untwisted it, I found another area in the intestine that was twisted that I was unable to fix. It probably happened very early on in your pregnancy and it seems that the intestine fused together and then twisted again. I couldn't do anything to fix it without damaging the bowel. Its purple right now, and it should be pink. So we closed him back up, and tomorrow morning we are going to go back in and see how it looks. If it's pink then we can close him up and he will stay in the NICU for a while and you guys will have a long road ahead of you. (I'm thinking okay, that's fine, we can do that...but I did not expect AT ALL the next words that came out of his mouth) If it's still purple, though (I'm thinking he's gonna say we will have to perform such and such surgery, do this, do that...) then we will have to close him back up, make him comfortable, and you guys will be able to hold him for a couple hours and then your baby will die." Excuse me? Wait. What? Die? Hold on. I'm confused. What did he just say? Did he just say my baby might die? Did he just say I might be holding my baby for a couple hours tomorrow and then he will die in my arms? Hold on. This can't be real. Tears welled up in my eyes and I just looked at Bodie and then back at the surgeon and just shook my head completely confused and utterly shocked at the words that just came out of his mouth. He proceeded to tell us that Dash was was taken up to NICU and asked us if we knew where it was. He introduced us to the lady, Susan-the neonatologist doctor who was covering the NICU unit. She offered to show us up to the unit. 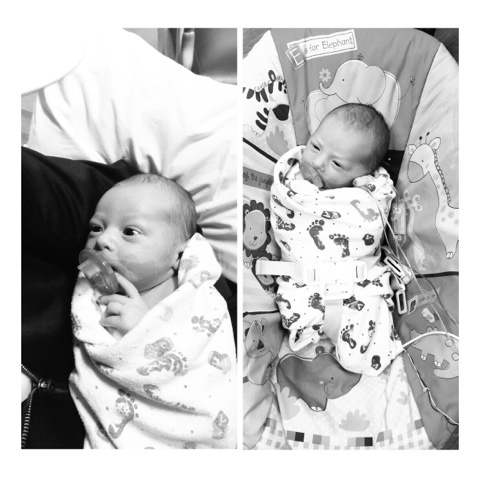 Bodie and I clung to each other and bawled and then slowly made our way up to NICU. Susan told us she would check to see if they had a room for us to stay in overnight. We reached NICU and as we passed the check in desk she asked the lady if they had any available rooms. I noticed her mouthing to the lady that we REALLY needed a room. The lady said absolutely. We went into the unit and were taken back around to his room. They had him in a personal room with a door as he was considered a surgical patient. We saw Dash just laying there on his little bed. Limp, still under heavy sedation and completely out of it from surgery. It was AWFUL. The nurses were hustling to get him all hooked up to IV's and such. Bodie and I just cried and cried. 2 hours ago I was holding him in my arms kissing him. 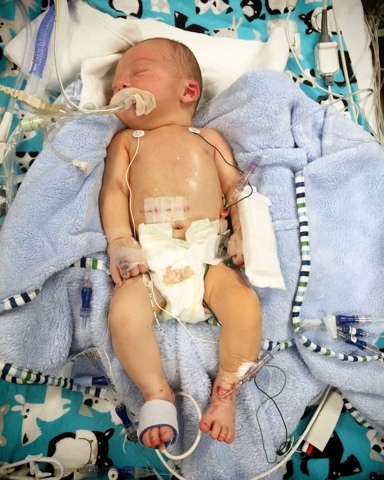 Now all the sudden he's gone through surgery and is in NICU and looked lifeless. They got us chairs and water, and we began making phone calls. I had to step out of his room and went to another area. Bodie made some calls, too. We just started asking everyone to pray hard and to spread the word to everyone else. I remember sobbing and saying to Bodie, "What are we going to do???" I just remember tears and more tears. I remember my heart hurting, literally hurting. I remember Bodie telling me that I needed to breathe. I remember seeing my husband in a way that I never hope to him see again for as long as I live. What was happening? How did this even happen? Family members notified us that they were on their way. Susan explained more to us about malrotation with volvulus and what it meant specifically for Dash. If you are like us you may not know that early in the first stages of pregnancy as your fetus is developing, the intestines are on the outside down near the umbilical cord. During the first trimester as your baby grows the intestine does a couple rotations as it enters the body and safely tacks into place. If the rotations are incomplete you have a malrotation. There are lots of people who live their entire lives with a malrotation and never have issues. Enter volvulus aka a "twist" in the intestine. Can be fatal. The twist prevents blood flow to the intestine which leads to the deadening of the bowel. And we can't survive with out our bowels. Of course there's lots and lots of intestine and we can have portions of it removed and still be fine. But not when you are only 3 days old and so much of the intestine is already purple and dying. So Dash had the whole bit plus some. Not only did he have one twist, but he had two. One that the doctor untwisted, and one that he couldn't. He said it was similar to a hernia. Susan told us that when he untwisted the first one the intestine should have immediately started to pink up. It didn't. Based off of what Susan said, the surgeon said, and nurses, it just wasn't looking good. Like. At all. Like, the surgeon said he is the longest pediatric surgeon in the state and has seen a handful of these cases. When asked how many survived he didn't give me a number. He didn't say none, but he would not give me a number. I can't really give a timeline for the rest of the night. It was a blur. Family started to show up; siblings, parents, aunts, cousins, nieces...The nurses tried to fill us in on what they were doing, what they were giving him. I remember being upset and telling them thank you, but none of that is fixing the problem. The other twist. I was grateful that he wasn't in pain, and that they were making him as comfortable as possible, but it was not fixing the problem. No one could fix the problem! The only possible way for Dash to survive and for that intestine to turn pink was an actual, literal miracle. We relied on God more than ever before. More than I ever thought possible. Last fall I got a new bar stamped necklace and picked the word "faith" for the stamp. I feel like my faith was already very strong before this happened. There have been some personal experiences in the recent past that I have had to heavily rely on my faith, and that have strengthened my faith immensely (hence the reason for my word choice of "faith" on my necklace.) When offering advice or help to friends experiencing trials my go to answer is ALWAYS faith. When placing myself in their situation, asking myself what I would do, my answer is always the same- faith, and prayer- rely on the Lord. Here I was faced with a ridiculously huge trial to test just how strong my faith really was. And I battled with it big time. I was sure I had enough faith. But then your mind starts racing. My mind and Bodies. Both of us- trying to be as strong and positive and as faithful as we could possibly be. Praying like never before. Begging, pleading with God to let us keep our son. relying on friends, family, strangers, church members, anyone- building an army of people who would help pray for Dash, and fast for him. Our home teacher left his family- this all being on the 4th of July of course- and came to the hospital and spent time with us and helped Bodie give a priesthood blessing for Dash. That was an incredible experience, might I add. Bodie gave an unbelievable blessing, and the presence of our Savior was definitely there. Bodie later said that he didn't feel like he was in the room while giving the blessing. He said that it was kind of an out of body experience. Almost dream like. So there we were. We knew we had a few hundred people praying and fasting for Dash. We ourselves were praying as much as possible and trying our very hardest to be positive. This is where the battle came into play. The thoughts started. Negative thoughts. Positive thoughts. Lots and lots and lots of thoughts. My son might die tomorrow. I could easily hold my baby tomorrow as he takes his last breath. I am going to have to bury my baby. How can God take my baby from me? I guess God needs him to come back home. But why? I just carried this baby inside me for 9 months, and there was never one single problem. I gave birth to him and we were discharged and he was completely fine. Now he is perhaps going to die? How am I going to go back to my home and see all his things? I have drawers and closets and cupboards and shelves full of his things. What am I going to do with it all? I will just leave it all there. I will leave all the clothes, and diapers, and wipes, and swaddles, and binkies, and rocker, and swing, and bath wash, and everything where it is. Okay, but seriously what am I going to do with it all? I guess I will give it away. My milk came in this morning. I am in a lot of pain. I need to pump. I will pump. I got a pump from the nurse. I am now pumping to simply relieve the pain. What am I going to do with this milk? Will he even be able to drink it? Am I going to have to give it away, too? No. Dash will drink this milk. How long is it going to take for my milk to dry up and the pain to go away? I am still in pain from delivery. I still have stitches. I am still bleeding. Please tell me I don't have to continue to recover from birth all while mourning the loss of my baby. Dollie. Dollie's brother. Dollie's baby. How do we explain this to a 2 year old? It's suppose to be Dollie and Dash. My babies. I love Dash, I can't have another Dash. Will I get pregnant again right away? Yes. Yes because I need a baby, I need Dollie to have a sibling close in age to her. No. No I will wait to get pregnant. I can't just get pregnant again to simply replace Dash. Where will we bury him? Do we have a funeral? Are we going to have to pay for all this even after he is gone? Is that even fair? Why would you even think about money at a time like this?! These new stretch marks on my belly that Dash gave me. I hope they never go away. 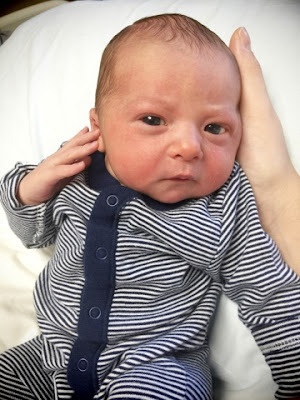 Those two little outfits- the grey striped one and the blue one, the swaddles, and the grey and blue blankets that he used in his first few days of life. I will keep those FOREVER. I can't go home I just can't. But I have to be strong for Dollie. Thank you God for letting me have Dollie. Pictures. WHY didn't I take more!? All I have is one of him when we brought him home plus all the ones I've taken here at the hospital. Thank you God that I hired Tara to do our birth story. At least I have those. Can't they just put him back inside my belly? He was fine in there. I could feel him move when he was inside me. I want to feel that again. HE IS NOT GOING TO DIE. HE IS NOT GOING TO LEAVE US. HIS INTESTINE WILL TURN PINK. HE WILL SURVIVE. WE WILL GET A MIRACLE. GOD WILL HEAR AND ANSWER ALL OF OUR PRAYERS. HE WILL DRINK THIS MILK! HE IS NOT GOING TO DIE! WE WILL HAVE DOLLIE AND DASH. Be positive. Stop thinking about all these things! STOP IT. Do I have faith? I must not if I am thinking all of these things. Yes. I do. I have tons of faith. But those doctors themselves said they are pessimistic about the situation. They keep telling us how rare this is and how very sorry they are for us. They keep looking at us with the saddest eyes. I can't believe my baby might die tomorrow. WHY??? How did this happen??? I must not have faith. No I do. I DO have faith! Right, Bodie? Not all of these thoughts were inside my head. Many of them were expressed to Bodie, and many of them he shared in common with me. Our main nurse that night- Lindsay (most amazing nurse ever) told us some of the IV's she was trying to get in had blown. They weren't cooperating. So she needed to do a PIC line. Okay, do whatever you need to do. That was about the time family started showing up. Probably about 8:00 pm. We visited with them and updated them on what was happening and answered their questions the best we could. My Dad ordered pizza, thanks goodness, because we were starving. Bodie actually didn't even eat. He probably lost 5 lbs that day. I couldn't not not eat. I was ferociously hungry as I had been nursing. What should have only taken 30-45 min to do the PIC line ended up taking like 2 hours. It's considered a surgical procedure so that area is quarantined and no visitors could go in. Just us. Which I did not go in because apparently its a pretty bloody ordeal. For those unfamiliar with a PIC line its basically an IV that starts at your foot, underneath your skin, that gets fished up through your vein up your leg and sits just underneath your heart. (I guess). So Lindsay is like a total pro at these and has done like 200+ but of course faced issues when it came to Dash. She tried one leg and it kept getting coiled in his knee. She tried the other leg and it kept getting coiled in his hip. Eventually she got it and we were able to allow family to come in and see him, and in a way say their goodbyes. Except no one really said goodbye of course. They were all very positive and encouraging, and crying. My Dad actually came in to see Dash with a little video camera and him and I sat and talked to Dash, telling him to be strong and that he wasn't going anywhere. It was really sweet. I remember thinking that it may be hard to watch in the future but that I would be grateful for it. PIC line was placed, meds were in place, they were keeping a watchful eye on him and letting him recover. At this point all the family had been in to see him and had mostly gone home. Dollie, my sweet Dollie. She was still there but I knew it was time for her to go home to bed. I had hardly had any time with her at all that whole day. I kept going into the waiting room to get more family to come in and see Dash and every time she saw me she would say, "Mommy cry? Mommy cry?" Over and over. She was very sad to see me cry. I tried hard to be better when I was with her, but my eyes were so swollen and red and puffy it was hard to hide. Both Bodie and I were a complete mess. I am sure to everyone we looked nothing like ourselves. Dollie went home to our house with Grandma and it was just me and Bodie. We got our things settled into our room for the night which was just down a short hallway from NICU, and we made our way back in to see Dash. We had been in and out all night with him. All the while I was carrying around one of his blankies that he had used since shortly after birth at the hospital. I didn't let go of that thing. I remember the nurses kept handing me boxes of tissues because I was using the blanket to wipe my tears. I didn't want the tissues. I just wanted that blanket. (I slept with it that night and have every night since. One night Bodie stole it from me.) Eventually it was so late and we were so exhausted that we headed back to our room. Probably around midnight. We knelt down in prayer and just poured our hearts out. As we both laid there in bed sobbing, I continued to pray. I then started thinking about all the stuff I believe about the law of attraction and the power of the mind and visualization. I told Bodie we really needed to do that. Specifically, we needed to visualize different things. Things like the tissue of the intestine turning pink, the surgeon cutting him open and pulling it out and seeing pink, them coming out of surgery and approaching us in the waiting room telling us it was pink. Eventually I guess we both drifted off to sleep. Waking constantly and having terrible dreams all the while. I couldn't sleep anymore. I pumped again for relief, spent some more time on my knees praying, got myself together, and headed down the hall to check on my baby. They told me the surgery had been moved from 10 am to 8 am. That was soon. I stayed in his room for about an hour. They told me he had a really great night and all his vitals were looking really good. They said usually they would start to notice babies getting sicker, but he didn't seem to be. Susan came in and I asked her about the surgery. I had been wondering about the color. I wondered why if it were still purple, and not black (dead), why we couldn't wait it out a little longer. She agreed and said that the surgeon would most likely look at it again and if it were still purple like the day before then he would probably wait it out a little longer. She said as long as its not worse then we should be able to wait. That made me feel a little more hopeful. Still, I couldn't get rid of the thoughts of the hours after the surgery if it was bad news. I couldn't even begin to imagine what those hours would be like. 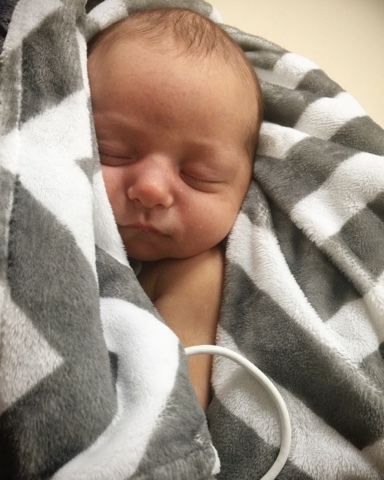 They assured us that if the news was bad then we would have a nice quiet labor and delivery room all to ourselves to hold him and love on him until he passed. They said they could make him very comfortable and keep the ventilator on for as long as we wanted. UGH. Sick to my stomach. It was just awful! I went back into our room about 5:30 am and Bodie got up. 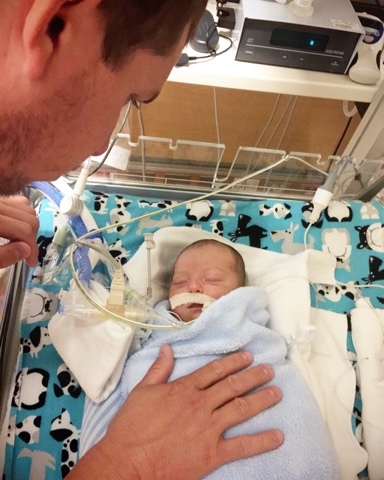 We prayed some more and headed back into NICU. We just sat in our chairs next to his bed and waited, crying all the while. Bodie was certain he had no tears left but sure enough they kept coming. (I have only seen him get watery eyes, and drop a single tear maybe once in the 11 years that I have known him) The nurses continued to tell us how sorry they were that we were going through this. 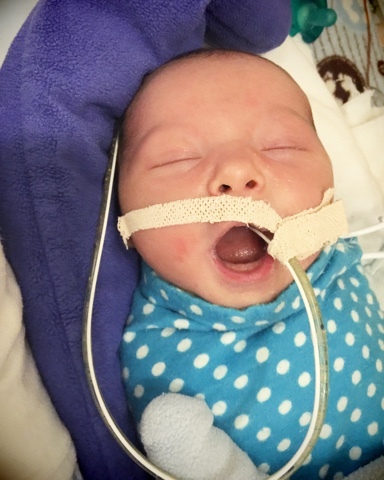 Just one hour before surgery, Dash's heart rate dropped dramatically. All of the sudden the nurses and Susan were panicking. Susan kept watching the heart rate and ordering the nurses to do different things. Finally she looked at us and with the most serious face and tone of voice she said, "I am very worried about your son right now. We are afraid that his bowel died during the night and it is making him sick." Another shocker. They had just told us how great he had done through the night. Another neonatologist came rushing in. His name was Steve. He seemed to be a pretty important man. Ends up he founded the NICU program 30 years ago. Anyway, he came in with a big machine to do an echo on Dash's heart to see the blood flow. His heart rate was dropping because the volume of blood was too low. They gave him a few things and it started to go back up. (In the long run they found out his potassium levels were too low, and they corrected the issue.) They needed blood volume up though so that he was in good shape for surgery. The surgeon came early and talked to us for a few minutes more about the surgery. 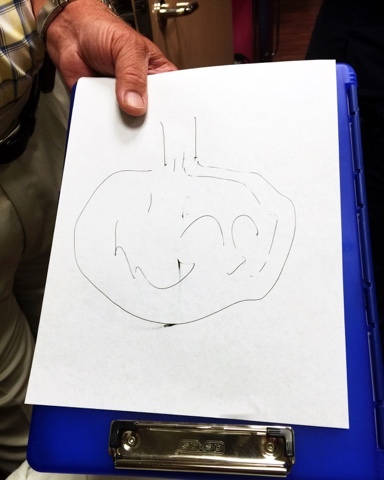 He drew a little picture for us to explain what he saw when he went in. I asked him if it were still purple and he did say that he would give it more time to pink up. So now we were just dealing with black or pink, really. Or I guess just anything worse looking than purple or pink. He told us how sorry he was that this was happening, and he told us how frustrating it is to look at him and he looked completely normal and healthy, but on the inside had this major issue. He explained a little more about malrotation with mid-gut volvulus and told me that the second twist- the hernia one that he couldn't get to- probably occurred before I even knew I was pregnant. He said the other twist, the one that he was able to fix, could have occurred at birth, or the day after. Who really knows. But since Dash was pooping it must have been opening and closing. As time drew nearer to surgery I knew it could be the last few minutes with Dash. You never know what can happen in surgery. So we kissed him and loved on him the best we could without holding him. I took some pictures. I told him to please tell Heavenly Father that he wants to stay with us here on Earth. I really kind of begged him to ask Heavenly Father if he could stay with us. I sang to him, we told me how much we loved him, and we followed behind them as they wheeled him down to the OR. Worst walk of my entire life. I honestly don't even know how our legs carried us. When we got down, just before they went through the doors, they told us to give him a kiss. In a way I felt like they were telling us to say goodbye with out saying that word. They went through the doors and Bodie and I completely fell apart. Again, I don't know how we stayed standing. I went into the bathroom and Bodie went into a small, dark waiting room. When I got into the bathroom I remember looking up to the ceiling, with my arms in the air, literally begging out loud for God to let me keep him. I remember asking him to please not take my baby from me. Then I realized that he isn't my baby that he in fact the Lord's, so I quickly said, "I know he is yours, but please let me keep him here and take care of him on this Earth for you." I met Bodie in the waiting room and we just sat there and cried and cried, and just kept falling apart. Truthfully, and it's hard for me to say this, but I had prepared for the worst. Which I absolutely hate hate hate! I think Bodie had, too. We knew that there was a chance. We were hopeful. We wanted so badly for them to come out and say PINK. But unless a miracle happened, Dash was gone. 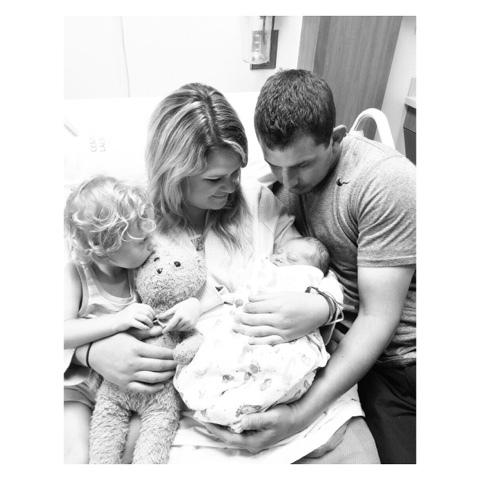 I remember Bodie choking out words along the lines of, "How do we hold our baby and say goodbye to him?" I don't know. I just didn't know. All I knew was that it felt like we were in a nightmare. I didn't even feel real, but it was so real. Too real. As awful the day before was, I felt that it was nothing compared to what the rest of this day could be. They said it would only take about 20 minutes to check the color. Just about 20 minutes later I heard a female voice say, "Wilsons..?" I jumped up and ran into the hall and I saw Susan standing there. I asked her if she was looking for us. She came running toward me saying, " I HAVE GOOD NEWS! I HAVE GOOD NEWS!" I simply said, "Are you serious? Are you kidding me right now?" In the most excited tone she said, "Yes! Yes! I'll show you!" Bodie was now standing by my side and Susan began swiping through pictures on her phone. There laid tiny Dash on an operating table, all of his intestines pulled out on top of his belly, and they....were....pink. PINK. PINK. PINK. I just looked at her, and looked at Bodie, and back at her, and back at the phone, and I was in complete shock. Not one tear escaped my eyes. Bodie was bawling, Susan was crying and shaking so bad. And I just stood there, frozen and speechless and in shock. She said it was pink with some purple, but it was completely viable tissue. She said they would be wheeling him back up to NICU and that the surgeon would be up to talk to us about the next steps. She walked away and Bodie and I clung to each other. Him still crying, me still in shock and not shedding one tear. So flippin' crazy. We immediately got on our phones and started sending texts and a making phone calls. All we really had to say was the word pink. I walked right back into that waiting room and knelt down in prayer thanking God over and over and over for this incredible miracle. We followed them back up to NICU with Dash on the table, once again completely out of it from surgery. We got to his room and the nurses and everyone were just freaking out. The surgeon came in just a few minutes later and shook Bodie's hand. We could tell he still had some adrenaline with what he saw. It was incredible. He proceeded to tell us that Dash would probably be in NICU for around a month. He said he would need another surgery in a month or two. He said for the next couple weeks we would watch his bowels and monitor a bunch of stuff. He said the tissue was viable and that it would be fine. 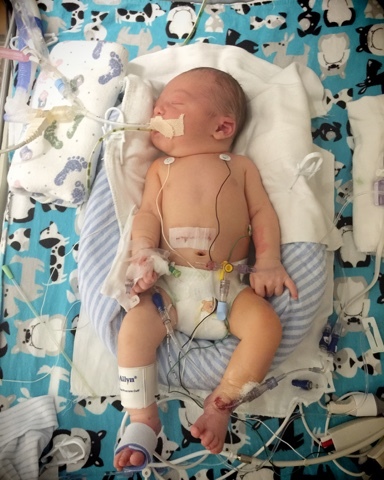 I asked him what complications we could be facing from this point on and he said just infections perhaps, and other minor things that the NICU nurses deal with a treat on a daily basis. He said," I think we are out of the woods as far as a dead baby." That's all we needed to hear. Our baby was alive. ALIVE. Words cannot describe what it was like going from complete pain and despair, to absolute JOY in a matter of minutes. Super, super intense. 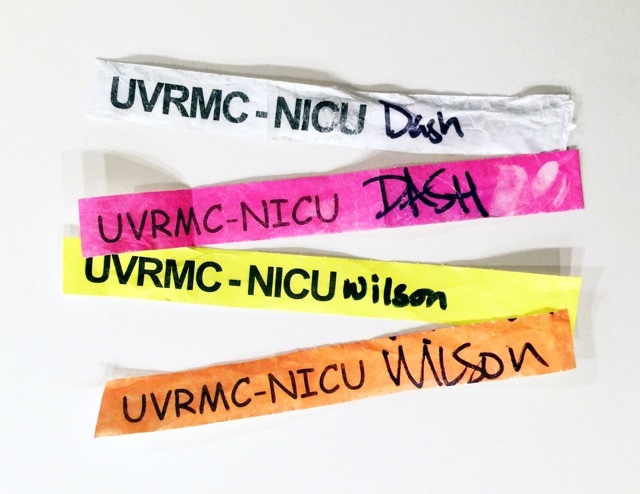 Things got a lot more serious now that Dash was going to be staying in NICU. Up until that point they had basically given us free reign. We came in and out with no wristbands, and we brought in whoever we wanted as often as we wanted among other things. Now it was down to business and we had to sign some forms, agree to some terms, and get official NICU wristbands. They went down the rules/guidelines, and also explained what would be happening with Dash at this point as far as his meds, care, antibiotics, and what they would be doing to keep him comfortable and help him heal. After we went through all of that and knew the game plan they recommended that we go decompress, get breakfast, and try to relax. We agreed and headed down to the cafeteria with my sister and our friends Kody and Ashley who were just arriving to come see us. We talked for quite a while over breakfast and just breathed. It felt so weird. 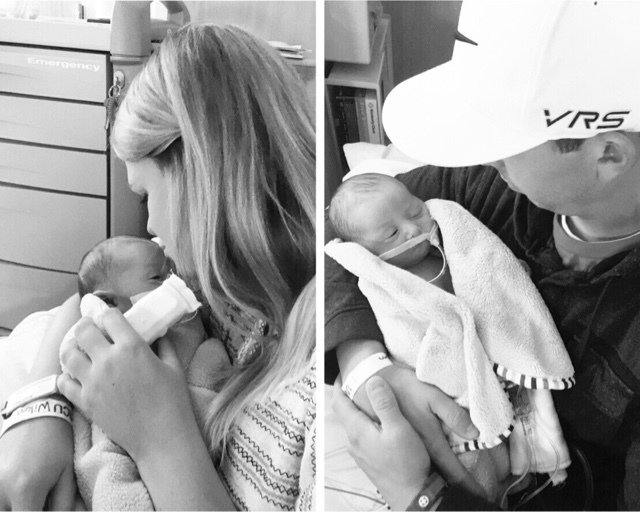 We went back up to NICU and visited with our Bishop, as well as Bodie's grandparents who came. Also we spent some time with my family who had driven up that morning. Later that afternoon Bodie's parents and aunt brought Dollie back and also his sister Brandee and her husband Luke arrived. We spent some time with all of them. Everyone was thrilled to meet Dash and know that he was still alive. All of Bodie's family left and we took a much needed long nap with Dollie in our room. Later that day Dollie left again and Bodie and I just relaxed and stayed another night there. It was Dash and our first official day being admitted into NICU. We got our new wristbands and headed in to see him. They told us he had a great night and then we met with Steve, the neonatologist who was doing Dash's notes and stuff that day. We had a nice long talk with Steve, re-covering everything that had happened up until that point. We asked a lot of questions, got a lot of answers. But there was one thing we talked about that Bodie and I will NEVER ever forget. Steve was training a newer doctor that day and while we were talking the new doctor asked us how it all went down in the very beginning and how we ended up there. We talked about the ER Friday night, we talked about the pediatrician the next morning, we talked about the decision to come to UVRMC. Which, by the way, Steve mentioned he is over the Board of something at American Fork Hospital and that he would make sure the situation (of them sending us home) was dealt with. Awesome. Anyway, as we kept talking I mentioned Dash being a miracle. Steve said,"We throw that word, miracle, around a lot these days. But the thing is is that your son actually is a miracle. You two saved your sons life." Woah. That hit hard. That was heavy, especially coming from a doctor. We will NEVER forget those words. After spending time with Dash that morning we decided it was time to pack up our things and go home for a shower and change of clothes. Once we got there Bodie's mom and Dollie left to go to our hometown a couple hours away until Friday. 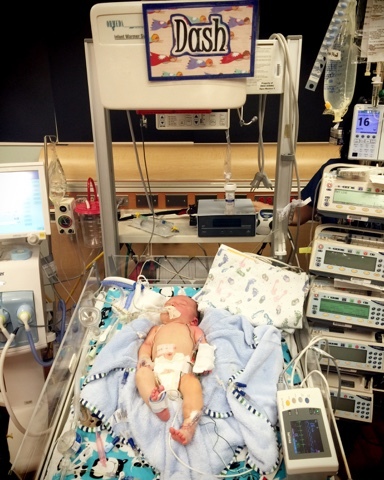 This would give us a chance to spend more time in NICU before Bodie went back to work, and also to get some rest. I didn't realize how difficult that would be until later that evening. We went back to the hospital for a while and then eventually ended up back at home. I had a really hard time being home. I found myself sitting in Dollie's room in her rock-a-bye chair crying. I just kept thinking how dumb it was for me to be at home without either of my babies. Thinking, "What a waste of time. I should be with one of them at least. Why am I here right now? I should be with Dollie when I am not with Dash. I wish Dollie was here." Eventually Bodie came looking for me and I explained to him how I was feeling. He was great and made me go for a walk outside. We face-timed with Dollie and it helped a little, but the rest of the evening wasn't the greatest. The next day we headed back to the hospital to visit, and then we actually went to a movie. It was nice to do that, just me and Bodie. We needed the time together, aside from all the emotional stuff. Wednesday Bodie went back to work and I knew there was no way I could spend much time at home alone. 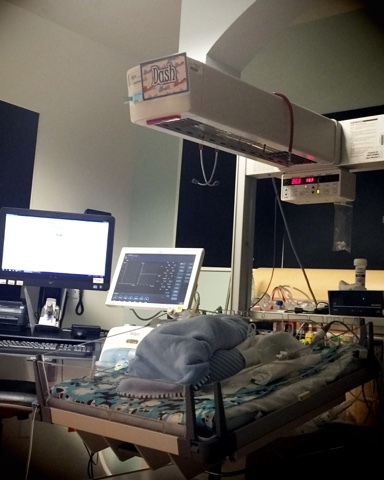 I made a plan to spend basically all day at NICU with Dash. 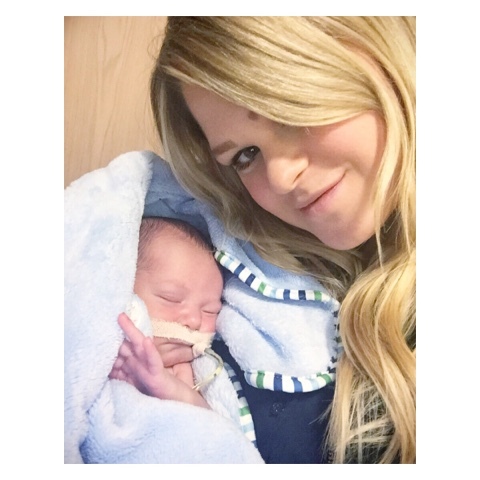 Between snuggle times I worked on this blog, putting together both Dash's birth story and this story. Also I had been on a very strict pumping schedule to get my supply up, so every 2-3 hours I would spend in the pump room. When Bodie got off work he came to visit. That's how it was Wed and Thurs and then finally on Friday Dollie came home. YAY! I missed her so dang much. 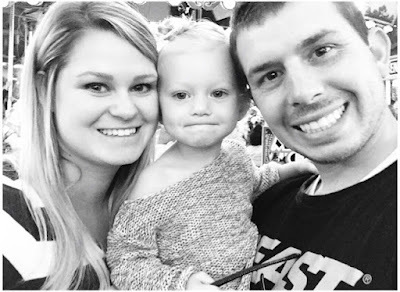 We spent the rest of the day Friday together, still visiting with Dash, but then we took her to a fair and rode rides and had lots of fun with her. I am grateful for Bodie's parents who were able to take her and spoil her all week so that we could spend lots of time with Dash and rest. So she is officially home now and life has to get back to normal-kind of. Now instead of us both being able to spend time with Dash at the same time, we have to take turns with Dollie in the waiting room. We don't have an exact system down, but we will figure it out. In a couple weeks when I start nursing Dash myself I will need to go to the hospital 2-3 times a day they said, so that will be interesting. We live about 35 min away. Evenings are no problem when Bodie is off work, but its the times during the day. We do have lots of help, though, and lots of people offering to watch Dollie. Speaking of help...I cannot believe all the help and support we have had through all of this. From our parents, to siblings, to extended family, to friends, to church members, to strangers...its incredible. We have had meal after meal delivered to our home, waiting for us when we get home from the hospital. We have had offers to help clean, get groceries, do laundry. So many offers to help with Dollie, and even set up a schedule for people to help with her on a daily basis. In addition to all of that- the prayers. Oh the prayers! So many texts, phone calls, and messages via social media offering thoughts and prayers for Dash. We just need anyone who has prayed for Dash to know that it means the WORLD to us. You have no idea. We read every single comment/message and are incredibly grateful for you. I just knew that in order for Dash to survive we needed 2 things: faith and prayers. Lots and lots and lots. And Bodie and I weren't enough. I knew that we needed an army, and an army is exactly what we got. So, THANK YOU. Thank for one prayer, thank you for 10,000 prayers, THANK YOU! 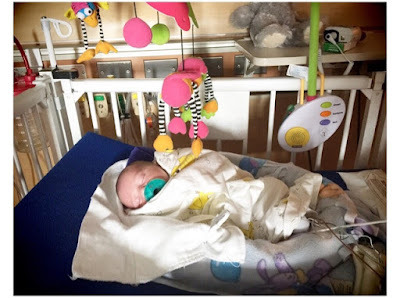 Although we still have a long road ahead of us, I just wanted to share some specifics and day to day progress since Dash's miracle on Sunday morning. Starting Sunday we have had small goals leading up to one BIG goal. First, Dash needed to recover from surgery, all while his bowels started working again. Once all this was complete we would reach the BIG GOAL: Milk. He would be on IV nutrition until that point. -We got to hold him for the first time, which we were told wouldn't be for a few days. 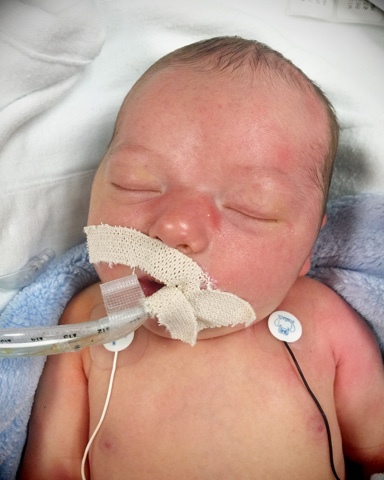 -The surgeon approved 5 ml (1 tsp) every 3 hours directly from a bottle as long as he wakes on his own, otherwise they will insert a tube through his nose to give milk if he's not awake. -He was placed in an actual crib! Dash continues to hold down milk. He wakes every 3 hours to eat on his own. Now the big question: What next? We continue to increase his milk volume until he is at full feedings. At that point we transition from bottle to breast. As long as the milk stays down, his stomach doesn't distend, and bowels continue to work then we get to home. Then in 1-2 months he has another surgery to try and fix the other hernia/twist. This surgery has to be done no matter what. What we need is for it to be done later, rather than sooner, so that he is bigger and stronger. IF any milk comes back up or stomach distends in the next couple weeks as milk increases, then he goes in for surgery at that time. We are praying that he continues to hold down the milk so that surgery can wait. This past week has been super crazy. Every day we hope and pray for more progress, and so far we have had progress every single day. It's really surprising that he is recovering so quickly. We are not complaining! But Susan said that if there ever was a set back it would be now, as milk has started. So here we go. I try to be there every morning when the doctors and surgeons are doing their rounds so I can hear the plan for the day and be there in person to ask any questions. We get a new color wristband each day before we go in. I pump every 3 hours and bring my milk in to my personal bin that's placed in the deep freeze. I have quite the stock pile! I pump both at home with a hospital grade pump rental, or I use the pump room at the hospital, or by his bedside when I am there. 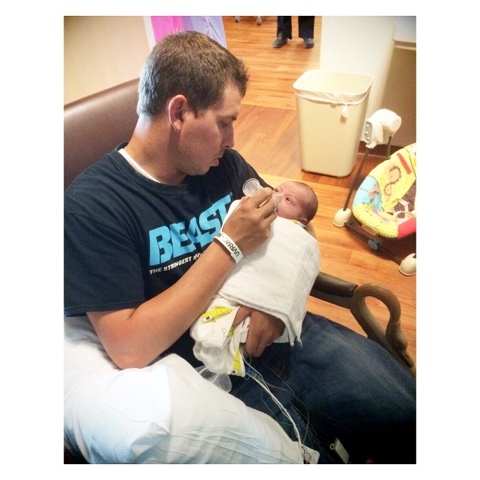 We help change his diaper when we are there, as well as take his temperature, and weight. We hold him and snuggle him as much as possible when we are there every day, but if he is fast asleep we do not bother him. Rest is the best thing he can get right now. We always go see him in the evening once Bodie is home. I call the NICU first thing in the morning to see how his night went, and also at night before I go to sleep. We are spending a lot more time on our knees every day. We LOVE going to hospital! Most people would probably hate it, but we so very thankful. We have grown super close to a couple of the nurses and doctors there. We love them! And a couple of the nurses always tell us and others that Dash is their favorite baby. They are the ones who were there from day 1, in the surgeries, by our side. They are the ones who witnessed the miracle. We always encourage them to hold him and snuggle him during the night if he needs it. They are the sweetest. Bodie always says they deserve to get paid like $800,000 a year. I agree. They are super good at what they do. At least the ones that are over Dash! Outside of the nurses and doctors that we know personally, every single day a new staff members comes up to us with tears telling us how happy they are for us and what a miracle he is. It's very overwhelming for me. It touches our hearts in the deepest way. I wish I could record everything everyone has said to us. Just yesterday I was talking with Susan (the one who left surgery early to deliver us the PINK news) and I kept telling her how overwhelming it all is because I just assume that they deal with these type of things on a daily basis. Among other things, she simply said, "You guys just need to understand that what happened was very special, and your son has touched many, many lives here." WOW! It's just crazy. There are no words. She also talked more about what it was like in the OR during surgery. She said everyone in there was just stiff, and holding their breaths while waiting to see the color. She said once she started to see it she gave a little thumbs up to one of the nurses. Once it was all out the surgeon told her to take pictures and someone asked if they should tell the parents. Susan said that its unheard of for a surgeon to allow another doctor to deliver their news, but that Doctor Black turned to Susan and gave her the go ahead to leave early and tell us. She said she is sure that probably was his "shocked" moment. Also, she told me that after the surgery she went downstairs to talk to Dr. Beverly. The doctor that we completely ADORE that was on the ball, requesting that we come directly to the ER and get the upper GI test done. We haven't seen him since then and we always talk about him. We LOVE him. He was so on top of it, and made us feel very confident with his urgency with Dash. Anyway, Susan went to tell him how it all went and I guess he was on the edge of his seat, telling her that she was going to make him cry. He was in disbelief. Also, apparently when the pediatrician called him to let him know we were on our way there, he was in full scrubs, getting ready for a surgery or something, and he completely dropped what he was doing, ripped off his things, and went straight downstairs to let them know a little baby boy was coming and needed to be admitted immediately. They say we saved Dash's life by getting there, but Dr. Beverly may have easily been the one to save his life. All I know is that Dr Black said if the bowel is dying it has 6 hours and then its game over. We hear and learn new things about Dash's experience every day from other people. Susan reiterated to me yesterday that it was a 95-5% chance for Dash's intestine to pink up. Crazy right? We are very much looking forward to what God's plan is for our son. We know it must be pretty special and important! Unbelievable, incredible, amazing, surprising, shocking....MIRACLE. We won't be throwing that word around like we use to. Life is different now. There are things that matter and things that simply do not. There are things that are worth stressing about and things that are not. Saturday July 4th 5:30 pm- Sunday July 5th 8:20 am: 14 hrs and 50 minutes. The darkest, most dreadful, terrible, and unreal seconds, minutes, and hours of our entire lives. There are no earthly words to describe what we felt. Here we are one week later, and we are getting ready to head to the hospital for the second time today to see our sweet baby Dash. We could not be more happy. God is absolutely a God of Miracles! Thank you so much for sharing your story. I am beyond touched by how much the Lord was with all of you through this whole ordeal. I will continue to pray for his recovery and healing. God bless! Oh, My goodness. I cried so hard just reading your experience. Such a Great Miracle! God is Good and He definitely answers prayers. Just found this and it made me cry! I related to so very much of it. My daughter had surgery in September, she had been sick on and off since her birth almost 3 years earlier and they finally diagnosed her with a malrotation and volvulus just in the nick of time.